Don’t Miss: The lovely old Ottoman houses in Antalya! Enjoy free time to explore Antalya and see why this beautiful historic city, filled with gorgeous beaches, magnificent ancient buildings and bustling markets and shops, is one of the top five most visited cities in the world! Spend the day in the lovely old town of Antalya. Explore the town, with its historic buildings, lovely harbour and pretty park at your own pace. Includes round-trip transfers from Side and various surrounding areas. 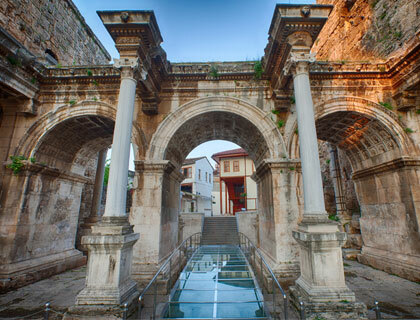 Enjoy five-hours free time to explore the lovely old town in Antalya at your leisure. Filled with beautiful buildings, historic Ottoman houses and with great views of the water from the park, Antalya old town is a particularly fascinating place to explore. Look out for the pretty harbour, ‘Broken Minaret’, old town museum and Hadrian's Gate - all of which present superb photo opportunities. Antalya Old Town is also home to outstanding boutique hotel and pensions, small art galleries and excellent cafes and restaurants – each offering something different. At the end a fascinating afternoon, you’ll be picked-up and taken safely back to your resort. The Antalya Bus Trip includes round-trip transfers from Side, Manavgat, Gundogdu, Colakli, Evrenseki, Kumkoy and Titreyengo hotels. 1st April to 14th October: Tuesdays and Saturdays. Pick-ups between 8.30am and 9.05am. Drop-offs between 5.30pm and 6.30pm.